Organizationally, the Technology and Learning Program (TLP) is moving under the leadership of AVP Wenshu Lee, and working closely with the newly developed unit of Faculty Development. TLP reports to Wenshu Lee, Associate Vice President for Faculty Affairs. The Interim Director of Faculty Development is Chico Professor, Zach Justus. This move is a welcomed transition to working more closely with the Center for Excellence in Learning and Teaching (CELT). We have worked together over the last 15 years, but it was from more disparate organizations. With all of us working closely with Chico’s faculty, and influencing and supporting Academy e-Learning over the last 7 years, it was a natural reorganization to make. We are happy to let you know about this change, and although we still reside in the basement of Meriam Library plans are underway to move us all into a more centralized location together. More about what all this means later, as time allows the transition to occur. One thing we want to offer to faculty is a more flexible schedule for consultations with our Instructional Designers and more opportunities for workshops on weekends or later into the evening as your needs dictate. Please let us know how we can better serve you and our 21st century students. Kaltura is currently Chico State’s streaming media tool that allows users to create, edit, and share videos within Blackboard Learn. Over the summer Kaltura was upgraded, and with that upgrade, a new workflow was introduced. To learn more about that upgrade and the new features, please watch this video. To learn more about how to work with Kaltura, please visit the Kaltura wiki support page. For more information, please contact the Technology and Learning Program at x6167 or TLP@csuchico.edu. 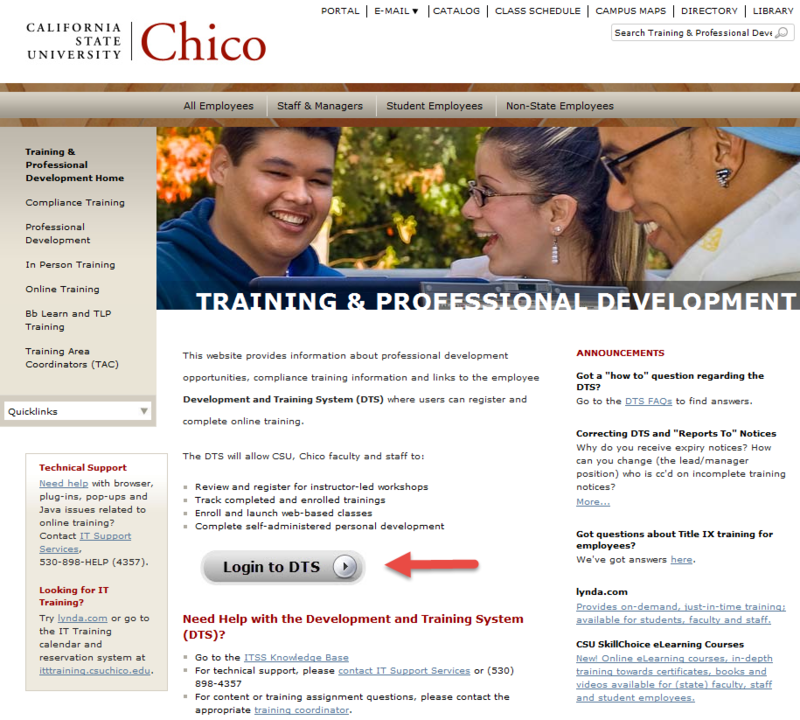 TLP has moved our training registration to the campus-wide, training system called DTS. View a central, campus-wide training calendar. Track enrollments and professional development. 1. From your browser, navigate to www.csuchico.edu/training. Note: You must have pop-ups enabled. TLP has found that Internet Explorer and Safari seem to be the least problematic. 2. Click Login to DTS. Note: DTS uses your State Employee ID, which is issued from the Chancellor’s office. If you are not able to login, submit a ticket with ITSS. 2. Select a course that works with your time frame. If you want to see all of the workshops offered by TLP, you can access the Course Catalog tab in DTS, or for a more reader-friendly version, go to the TLP web site and click Workshops on the left menu. We continue to experience an issue in Blackboard Learn with the YouTube Mashup and Video Everywhere tools. Record a video using Video Everywhere. Add a YouTube video to Blackboard Learn using the YouTube Mashup. Access YouTube videos after the course copy process. Copy and paste the embed code to your YouTube video within the Bb Learn Content Editor using the HTML view. This method plays the video within Bb Learn. From YouTube, access your video’s watch page. Click on Share just below the video. Click “Embed” to get the embed code..
From Bb Learn content editor, select the HTML button and paste your embed code into the HTML view. This method plays opens a new browser and plays the video on YouTube. Copy and paste the link to your video as web link directly within an item, discussion board post, etc., using the hyperlink button in the Content Editor. Select the text you want as a hyperlink. Click the link button in the content editor. If you were trying to record a YouTube video using the Video Everywhere tool, you can record your video directly on YouTube. Then use any of the methods above for copying and pasting the YouTube video link into Blackboard Learn. Alternatively, you can use the Kaltura Media mashup and record your webcam that way. Please drop by or call the TLP lab to have us walk you through these options if you need additional help.We are glad to assist. Our phone number is (530) 898-6167. We are open Monday-Friday 8:00-5:00. New version of Collaborate with easier setup! Blackboard recently released Bb Collaborate “Ultra,” a streamlined version of Bb Collaborate that runs directly in your browser without any need to install Java or use a separate launcher. So far, users have almost unanimously preferred the new experience, but instructors who rely on breakout rooms, plan management, or certain other features should continue to use the “classic” version for now. After August 20, 2015, we can enable Collaborate Ultra on a course-by-course basis. You can switch over some, or all, of your courses by submitting a TeamDynamic service request. In the meantime, we will enable Collaborate Ultra in all “prep areas,” so that you can get a preview. The new experience does not yet support every feature that’s offered in the classic version. So far, users have almost unanimously preferred the new experience, but instructors who rely on breakout rooms, plan management, or certain other features may continue to use the classic version for now. TLP is working to create a new workshop/tutorial to assist those faculty who wish to use the Bb Collaborate Ultra version. Please have patience as it was just introduced to us, too!! Keep visiting our TLP website for announcements on the right side of our homepage.